For newer phones (C72, C75, ME75, S75 a SL75) use PapuaUtils077. 2. Put px71v1 to your phone using MPM, SiMoCo or something similar (Java/Jam/Applications/px75v1). 3. Run px75v1 (Menu -> Surf & fun -> Applications -> px65v4). 4. "Local connection?" - choose "For session" and OK.
5. "Allow Java to access data cable?" - Yes. 6. Wait for displaying codes. 7. When the codes are shown, don't close the application and run Papua. 8. Choose correct COM in Settings. 9. Go to the Codes. 10. Push Px75v1. 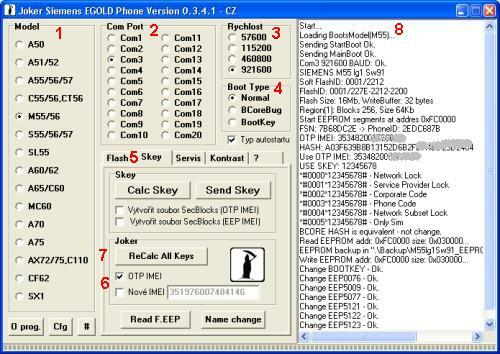 Papua should read IMEI, ESN and HASH. 11. Click Calculate SKEY and BootKEY - Papua will calculate SKEY and BOOTKEY. 12. In the phone close the application and go to the main screen. Don't turn off the phone! 13. Enter correct HWID (if you don't know what is your phone HWID, you can read it from the list near the HWID field). 14. Click Enter SKEY in phone. Papua will write SKEY to the phone. 15. After SKEY writting, click Freia.log. 16. DON'T SAVE *.log file! You must choose CANCEL. 17. Confirm next question (choose Yes). 18. Turn off and turn on your mobile. Simlock or phone code shouldn't exist. Is this solution really works? Wil it with ME75/C75? I tried using px65v4 and px65v5 on my A65 but when I run the application, it just says Please Wait... and nothing more happens. I let it run for a few hours, still nothing happens. Can you please tell me what I do wrong? This is only for SGOLD phones. A65 is a EGOLD. For unlock A65 use joker without java application. In the last step (number 8 ) you need to click on the red button. you can't do that with a dca-540.. you need a serial cable.. dca-540 is a usb cable..
What's the procedure for getting rid of the last attempt of entering the phonecode that I don't know, please!?.. :-? everything worked until the phones were still alive. EF81 and S68 are different phones, EF81 is BREW and S68 is new sgold platform. DCA-540 works as a service cable (for fw flashing, applying patches etc.) only for EF81. To be able to unlock phonecode on S68 you will probably need a DCA-100 (COM) or DCA-110 (USB) cable .